The Lake Merritt Institute is 501-C-3, non-profit charity, founded in 1992. We are supported and sponsored by the City of Oakland and members like you. With over 120 members, the Lake Merritt Institute is a community based, non-profit corporation that works with volunteers, schools and the City of Oakland in a cooperative, positive relationship. With an office on the shores of Lake Merritt, the Institute is led by a board of directors and an executive director, James Robinson. Founded in 1992 by Dr. Richard Bailey, we are supported by the City of Oakland, and members like you. $100 REWARD for information leading to the arrest of anyone dumping paint, cement, plaster, soap, trash or oil in the Lake Merritt Watershed. Email [email protected] for details. The Clean Lake Program: Since December 1996 we have been removing 1,000 to 6,000 pounds of trash from the lake each month under a contract with the City of Oakland.Much of the work is done by volunteers. Education: Our power point sound and slide show presents fascinating details about Lake Merritt, urban runoff (our biggest source of water pollution) people, history and wildlife. Aeration Fountains: Through the generosity of a donor and the City of Oakland, we have installed and maintain three aeration fountains. They provide badly needed oxygen to the water and an aesthetic enhancement to our Lake. Our monthly bulletin provides up-to-date information on the natural history of the lake, city projects, news, photographs, opinions, and an occasional poem. We have obtained grants, taught classes, promoted mechanical harvesting as a replacement to herbicide use, pushed for storm drain filters, and installed bulletin boards, tide gauges, and “U-Clean-It” stations. St. Paul’s Episcopal School 6th grade students volunteer every week. Keeping the Lake clean depends on you. 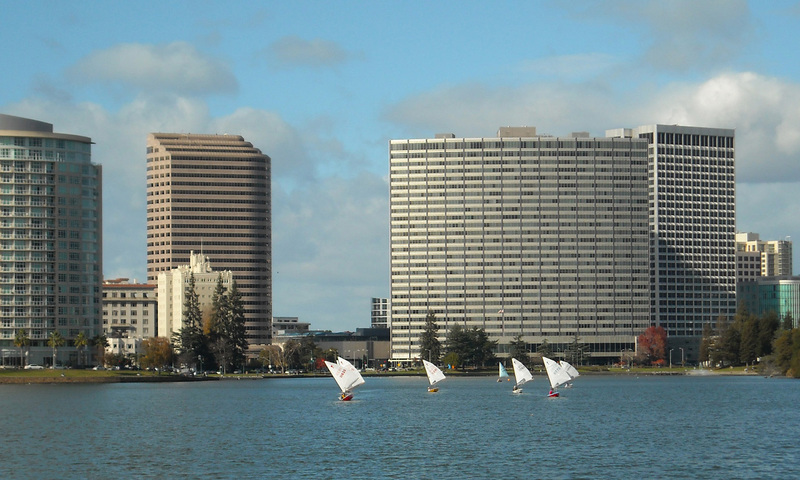 Each month, thousands of pounds of trash accumulate in Lake Merritt. It is removed by retired folks, professionals, housewives, school children, civic organization members, and people just like you and your friends with the help of our staff. Clean ups are held five times a week during the school year and 3-4 times a week in the summer. If you don’t volunteer, the trash will stay in the lake. I would like to help clean the lake! Call (510) 238-2290 or schedule a group by email [email protected]. You can also come as an individual on any Tuesday at 10:30 or Saturday at 10 am. We meet on the 2nd floor of the Sailboat Clubhouse, 568 Bellevue Avenue in Lakeside Park. It’s the first big, blue building on the right. Go up the stairs at the end of the parking lot. If you see the duck pond, you have gone about 100 yards too far. HINT: You may also work alone by using one of our four U-Clean-It Stations where you will find gloves, trash bags, barrels, nets, directions and a sign in sheet. The lock combination for the boxes is 1616.